Going to a bar, café, sports game or the movies can seem almost impossible if you are planning to eat or drink anything at the venues as sugar is added to most things. Many of these businesses capitalise on the fact that you are going out to enjoy yourself. Who wants to go to a place with delicious food and drinks and feel deprived? There is a fair few things you can do to make sure you can still go out and enjoy yourself without feeling like you are being difficult and still adhere to your life-style choice. Ask your regular places (or find some new ones ) how much sugar there is in the various recipes you would normally eat or drink. Then ask for alternatives. 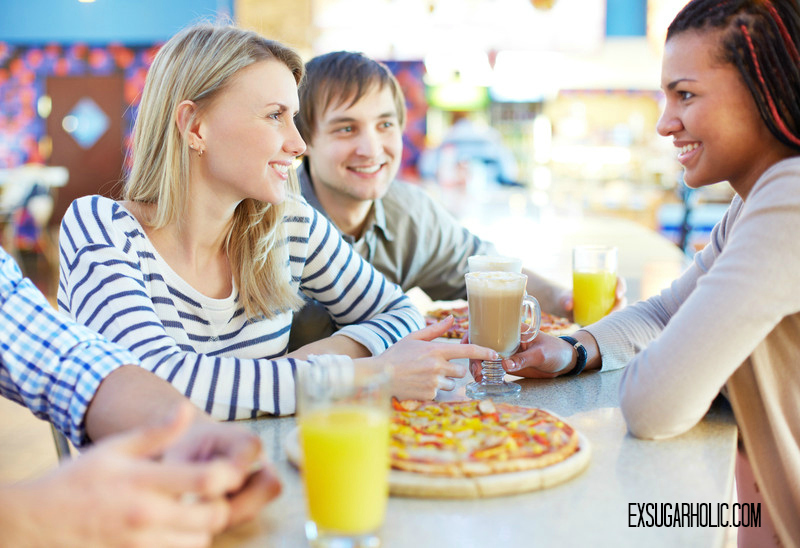 You can ask when you are there or you can call or email them in your own time, so that when you go with your friends that, just like them, you can just look at the menu, picking something, and then enjoy it. Sorted! If you are going somewhere you haven’t been before you can still contact them ahead, but if you don’t have time or only find out last minute – do some research in general. Get street-smart on sugars, know your stuff. Find out what the biggest culprits are on restaurant menus and which are the best options (this would depend on what type of food you normally go for). This will allow you to make easier choices when you have a new menu in front of you. You can, of course, always ask the staff in the venue. If you have to choose something from a café to takeaway, there are usually a couple of gluten free and dairy free options, however, sugar-free is still highly unlikely to be on offer in your typical café. If you have time, order something from the sit-in menu and ask if you can take it away. Many things on lunch menus are naturally sugar-free but ‘glass cabinet’ offers typically aren’t if you are looking for lunch. If you would like to see more articles like this and sugar-free recipes you can follow me here (via email, see top right on this page) or on Facebook.